In a post 9/11 world, the government has emphasized the need for enhanced security in different locations serving many purposes; from protecting the transportation infrastructure of the country to making sure food and water reservoirs remain uncontaminated. In addition to government resources, private business and citizen support is needed to properly monitor the myriad of sensitive locations and materials. Modern technology allows an efficient approach to this concept through the use of portable personal electronic devices such as camera cell phones or Personal Digital Assistants (PDAs). The overall approach of this project is use existing, readily available technologies and resources to develop a low-cost system that receives and delivers video, text, etc. based on geographic location. This project developed a prototype system that can serve as a modern high-tech “Neighborhood Watch” enabling law enforcement officials access to the many “eyes and ears” of the public. Cell phones with embedded digital cameras allow the instant capture and remote submission of suspicious circumstances through pictures or video to authorities that may warrant further attention or action by law enforcement. Not only does this give the responding party a visual representation of the situation, but other information such as time, date, voice recordings, and physical location of the reporting party in Global Positioning System (GPS) coordinates can also be automatically attached to the report. 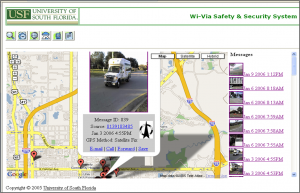 Upon submission, the picture or video and other information is automatically processed and displayed on a map-based web page to give the dispatcher a real-time “birds-eye” view of incoming alerts. The system intelligently filters and organizes submissions so they can be efficiently managed, therefore allowing the dispatcher to handle many more submissions simultaneously identifying trends and patterns that may not be immediately obvious to a human observer. 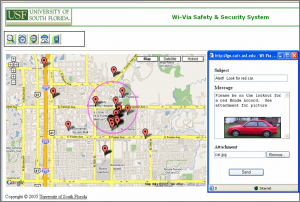 Another aspect of the system is its “reverse 911” component for data-enabled mobile phones. When a threat to the public or individuals is identified, the dispatcher could instantly relay a message to individuals with cell phones or PDAs in a certain geographic area. Examples of such information could be the need to evacuate a particular area (e.g., hurricane) where the real-time control of when, where, and to whom such information is disseminated. Another example is distributing an Amber Alert photo of a missing child to the geographic area where the child was last seen. 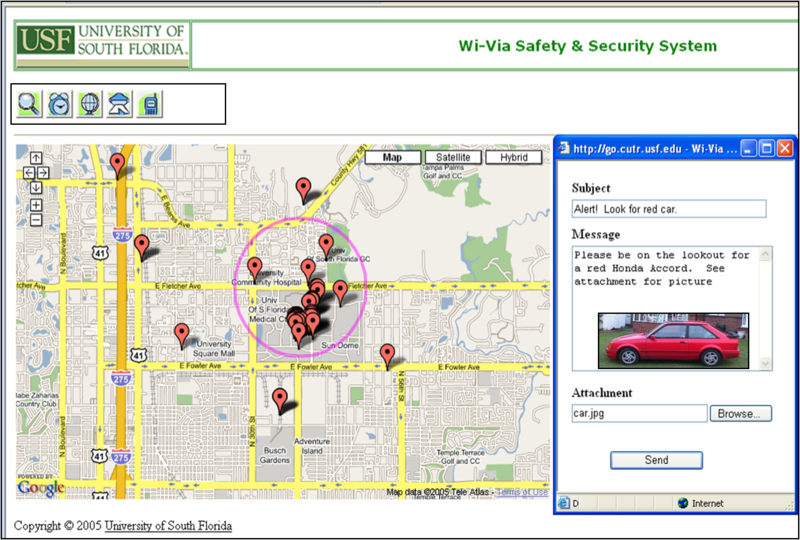 The project team has successfully implemented a prototype application that runs on a cell phone, reports the position of the phone to the server, and then, based on calculations against a Hillsborough County map, returns a text message to the phone with information on the hurricane evacuation zone that the individual is currently located in (i.e “You are in Evacuation Zone C, which is currently under a mandatory evacuation order”). Portions of the technology discussed in this report are protected under U.S Patent 8,045,954 “Wireless Emergency-Reporting System” and U.S. Patent # 8,145,183 – Hurricane Evacuation Zone Locator System and Method.